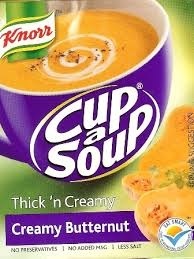 Cup-a-Soup is an instant soup product sold under various brands worldwide. The soup is sold in sachets of powder which can be poured into a mug or cup, which is then filled with near-boiling water and stirred. In the United States and Canada the product is manufactured and marketed by Unilever's Lipton brand, and in Australia under the Continental brand. In the United Kingdom the product is sold as Batchelors Cup-a-Soup, a brand which is now owned by Premier Foods. In the Netherlands it's sold under the Unox brand. In South Africa it's sold under the Knorr brand.